You can hire our hot dog machine and you run it yourself or we can supply it with a operator. The hot dog machine can hold up to 150 hot dogs making it easy to deal with any size party or event. It holds 40 buns. We will supply all the required items including machine, quality hot dogs, buns, napkins, ketchup and mustard. If you dry hire we also will supply instructions for running the machine. We supply the hot dog machine as a table top machine. Or if you need it we can also supply a table and tablecloth. To hire the machine we will need access to a 240v/13amp electricity supply within 20 metres. 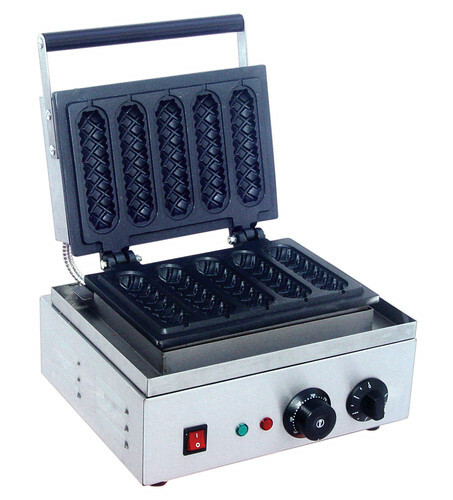 The machine is very easy to use, the machine simply steams the hot dogs until the cooked temperature is reached. YOU CAN PURCHASE EXTRA HOT DOGS AT £60 FOR 100 THIS INCLUDES BUNS TOO. HIRE CHARGE IS FOR 4 HOURS. IF YOU NEED THE MACHINE WITH ANY STAFF WE CAN PROVIDE THEM FOR £15 AN HOUR. All of the options on the right are unmanned if you would like a member of our staff to do the waffles at your event we can supply them at £10 an hour. We can also provide a table if none is available but please tell us at the time of booking the machine. If the machine isnt manned then we require a deposit of £100 and this is returnable at the end of the hire as long as the machine isnt broken or damaged. Chocolate, Cream, Peanut butter, Sprinkles, Chopped nuts, Nutella, Jam and Sauce. Want something sweet for you and your guests then the waffle machine might be what your looking for. Comes with all the ingredients you need to make the waffles and they have little paper trays they can sit in so you dont spill anything. You can have tops like chocolate and nuts chocolate and sprinkles chocolate and cream or just cream the list is endless we supply the toppings and the more waffles you want the more tops you can have. Why not add a Potato Oven to your party. 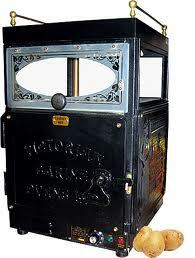 Our Victorian Potato Oven bakes 30 potatoes in the oven and keeps a further 30 warm in the top. Ideal for school fetes, team building events, corporate events, fund-raising days, charity events and private parties. We dont supply the potatoes the hirer has to. We can supply staff at £10 an hour if you need it manned please ask when you hire it. Slush syrup is available separately from £25.00 per five litres. If you want staff to man machine then it is £10 an hour. If you decide to do it yourself there is a £100 deposit payable on machine and will be returned at the end of hire as long as machine isnt broken or damaged. Hire time is 5 hours longer or shorter times can be arranged. Great for them summer days and everyone loves a ice cold drink when the sun is out. Add this to the party and keep all your guests chilled out. 50 cups and straws and a choice of 2 flavours. We will mix the flavours all you have to do is add the mix when it is needed for your party. 100 cups and straws and a choice of 2 flavours. This machine is great for an extra addition to your party children and adults can have great fun. 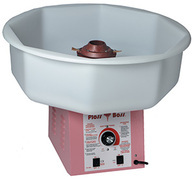 We can either hire the machine to you and you can have the fun in making the candy floss or if you want to mingle in with your guests,we can supply a professional operator. You can choose how many servings you want from 20 for them small parties or we can cater for them bigger events with unlimited sevings so great for weddings,fetes or corporate events. Our Candy floss isnt just a colour it also is flavoured. 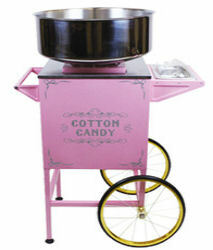 Our candy floss machine is easy to use and we will supply the machine,cart,sugar which includes flavouring/colouring,sticks and bags. We will also show you how to use the machine if you are using it as a dry hire. At the end of the event we will come back and collect the machine and take it apart. Please let us know what flavour you would like from the following. Everyone loves popcorn the smell of it draws you in. Well now you can have the fun of making it too. You can hire this machine at a fete,wedding or corporate event. We can either hire the machine to you and you can have the fun in making the popcorn or if you want to mingle in with your guests,we can supply a professional operator. 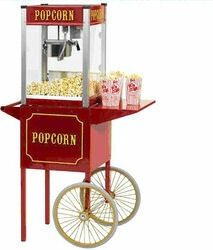 Our Popcorn machine is easy to use and we will supply the machine,cart,oil,sugar or salt scoop and bags.